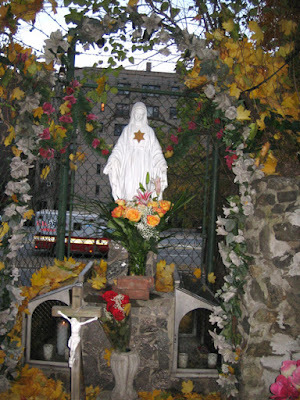 A site regarding the apparitions of Our Lady of the Universe on the Grand Concourse in The Bronx. you are a Queen because you are the Mother of the Word Incarnate. by His personal union with the Divinity. He is King and You are Queen of all hearts. and peace for the whole world. A statue or picture may be blessed; If convenient, ask a priest to perform the ceremony, otherwise the head of the family can do it. Prepare her altar with flowers and candles, giving her an honored place in your home where all will see her and often pray to her. Mary Immaculate Queen: Triumph and Reign. O Mary Immaculate Queen, look down upon this distressed and suffering world. Thou knowest our misery and our weakness. O Thou who art our Mother, saving us in the hour of peril, have compassion on us in these days of great and heavy trial. We recognize thy Queenship and ardently desire thy triumph. We need a Mother and a Mother's Heart. Thou art for us the luminous dawn which dissipates our darkness and points out the way to life. In thy clemency obtain for us the courage and the confidence of which we have such need. Most Holy and Adorable Trinity, Thou Who didst crown with glory in Heaven the Blessed Virgin Mary, Mother of the Savior, grant that all her children on earth may acknowledge her as their Sovereign Queen, that all hearts, homes, and nations may recognize her rights as Mother and as Queen. Amen. MARY IMMACULATE QUEEN Triumph and Reign. "As the vine I have brought forth a pleasant odour: and my flowers are the fruit of honour and riches. I am the mother of fair love, and of fear, and of knowledge, and of holy hope. In me is all grace of the way and of the truth; in me is all hope of life and of virtue." which we ask of you today. our interior trials and sufferings. through the merits of your Divine Son, Jesus. Mary, Queen of All Hearts, Queen of the Universe. heal both body and soul. and grant us final perseverance. O Mary, Queen of All Hearts and Queen of the Universe, help us, we have in confidence you. From the depths of this tearful earth where sorrowing humanity makes weary progress – through the surges of this sea of ours endlessly buffeted by the winds of passion – we raise our eyes to you, O Most Beloved Mother Mary, to be comforted by the contemplation of your glory and to hail you as Queen of heaven and earth. Queen of mankind. Queen of Peace. With legitimate filial pride, we wish to exalt your Queenship and to recognize it as due to the sovereign excellence of your whole being, O holiest One, truly Mother of Him Who is King by right, by inheritance, and by conquest. Reign, O Mother and Queen, by showing us the path of holiness, and by guiding and assisting us that we may never stray from it. In the heights of heaven you exercise your primacy over the choirs of angels who acclaim you as their Sovereign, and over the legions of saints who delight in beholding your dazzling beauty. So, too, reign over the entire human race, above all by opening the path of faith to those who do not yet know your Divine Son. Reign over the Church, which acknowledges and extols your gentle dominion and has recourse to you as a safe refuge amid the calamities of our day. Reign especially over that part of the Church which is persecuted and oppressed, giving it strength to bear adversity, constancy never to yield under unjust compulsion, light to avoid falling into enemy snares, firmness to resist overt attack, and at every moment unwavering faithfulness to your kingdom. over their hearts, that they may love nothing but what you yourself love. Reign over individuals and over families, as well as over societies and nations; over the assemblies of the powerful, the councils of the wise, as over the simple aspirations of the humble. Reign in the streets and the squares, in the cities and the villages, in the valleys and the mountains, in the air, on land and on the sea; and hear the pious prayer of all those who recognize that yours is a reign of mercy, in which every petition is heard, every sorrow comforted, every misfortune relieved, every infirmity healed. Obtain for us that all who now in every corner of the world acclaim and hail you Queen of Peace, may one day in heaven enjoy the fullness of your kingdom in the vision of your Divine Son, Who with the Father and the Holy Spirit, lives and reigns for ever and ever. Amen. Pray for us, O glorious Mother of the Lord. who have honored your handmaid Mary as mother and queen. and be welcomed into your eternal kingdom. Agur Maria, graziaz betea, Jauna da zurekin. bedeinkatua da zure sabeleko fruitua, Jesus. At pinagpala rin naman ang anak mong si Hesus. This is a website on the apparitions of the Blessed Virgin Mary who is titled as Our Lady of the Universe or Our Lady of the Concourse. She is said to have appeared in The Bronx in 1945 to Joseph Vitolo Jr. on a lot adjacent to the Grand Concourse. As a Bronxite and Catholic, I decided to restart the website after it was defunct. I find the apparitions comforting and fascinating and wish to spread devotion to the Blessed Mother as Our Lady of the Universe/Our Lady of the Concourse. If you have any information, photos, were present or know anyone who was, please do not hesitate to contact me. I want to collect as much information possible about these apparitions. I hope you enjoy and obtain many graces here. This site is not affiliated with the Oueen of the Universe Shrine in The Bronx or the Vitolo family. God bless + Mary keep! 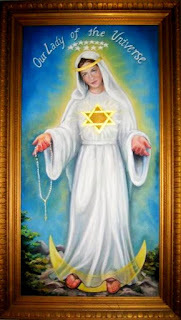 All posts and original content are copyright Sacerdotus/Our Lady of the Universe/Concourse. Sacerdotus/ Our Lady of the Universe /Concourse Copyright © 2017-2018. All Rights Reserved.. Watermark theme. Powered by Blogger.